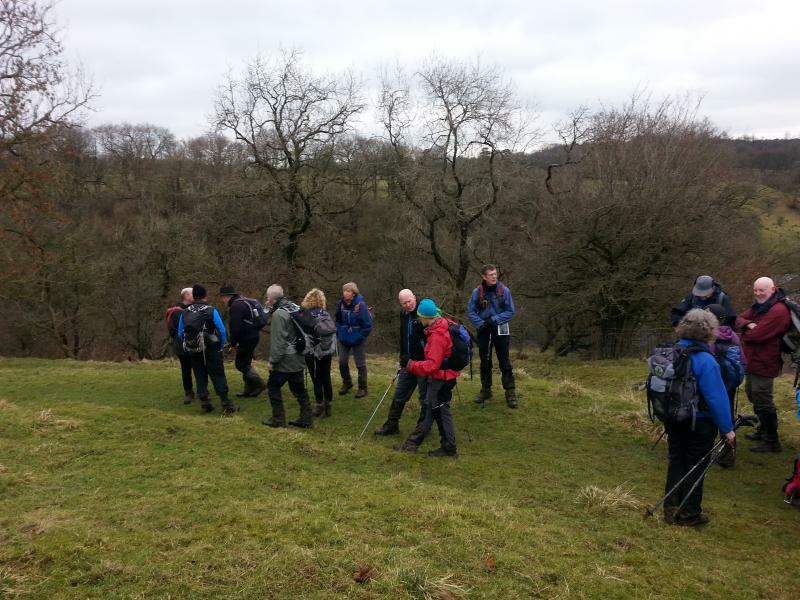 East Lancashire LDWA - Fabulous or Freezing February? Wednesday February 22nd. What the Doctors Ordered. 10.5 miles. Leader: Mike Lee. 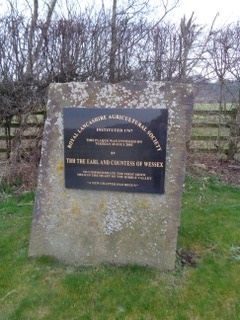 The title of the walk is a reference to the Whitworth Doctors. These were several generations of the Taylor family who practised as doctors in Whitworth for about 100 years from the latter part of the 18th century. Despite not having the benefit of any formal medical training, they achieved celebrity status and patients travelled long distances to consult them. 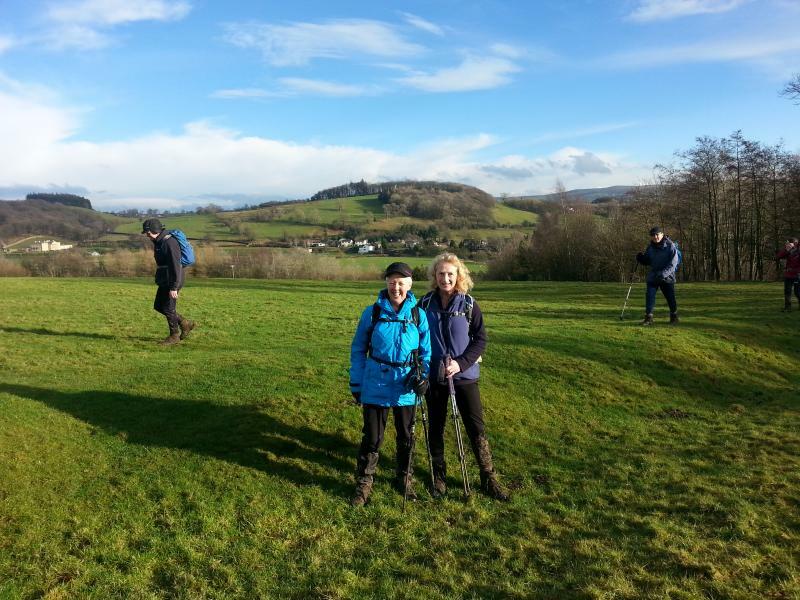 They encouraged their patients to take long walks in the countryside, hence the title of the walk. 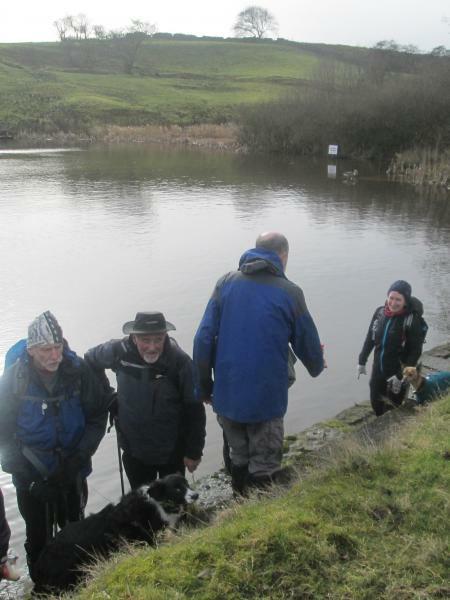 Sixteen walkers and two dogs met in the car park on the dam of the Cowm Reservoir on the outskirts of Whitworth. 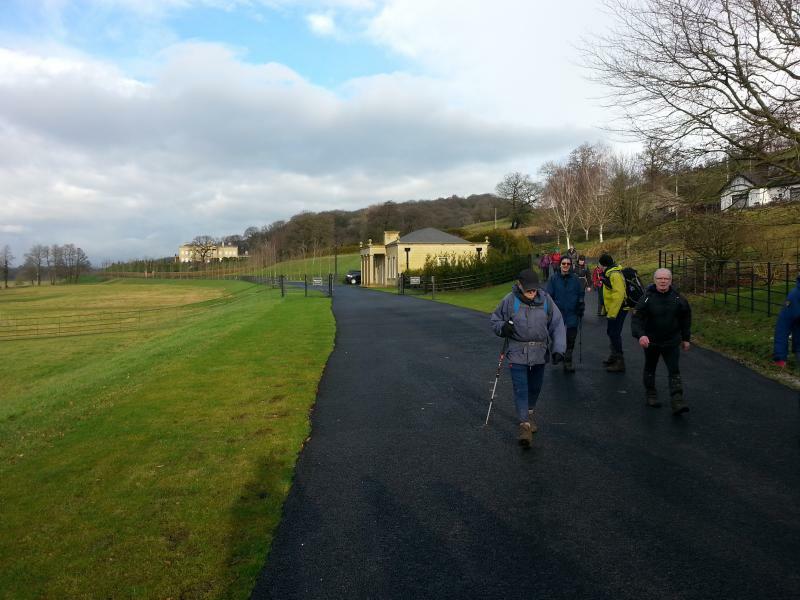 The weather looked decidedly unpromising, with dark clouds overhead, as we set off along the track alongside the reservoir. We paused briefly to look at a plaque commemorating the feats of James “Treacle” Sanderson, a champion runner in the late 19th century, who trained on this flat track. The lines he carved on the wall to mark a 440 yard distance can still be seen. 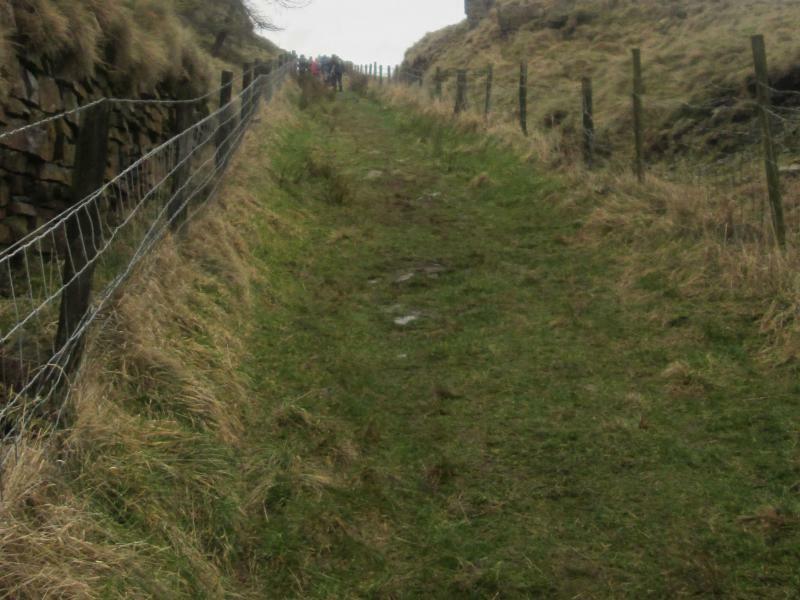 Continuing around the reservoir, we passed through the ruined hamlet of Cowclough and followed the very wet and muddy old road to Hall Fold. 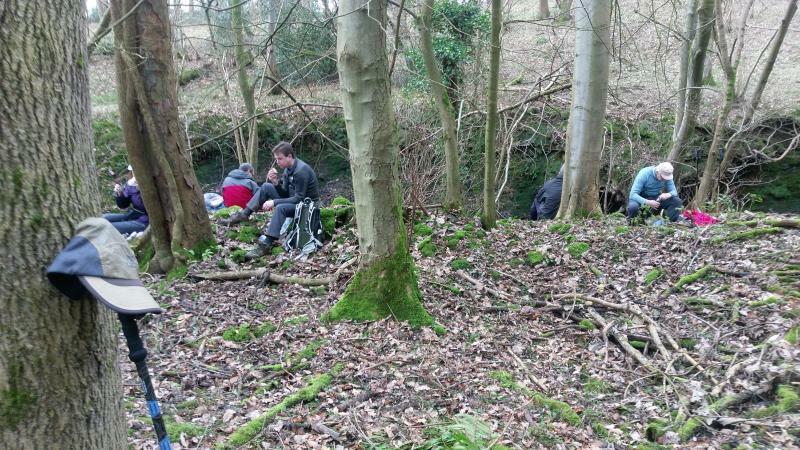 From there we followed the Rossendale Way to Bagden Quarry, stopping on the way for morning coffee. By this time it had started raining, but only lightly! On the way up to Bagden Quarry we passed above Fern Isle Wood, known locally as Doctor’s Wood, where the doctors are reputed to have gone to collect herbs for their potions. 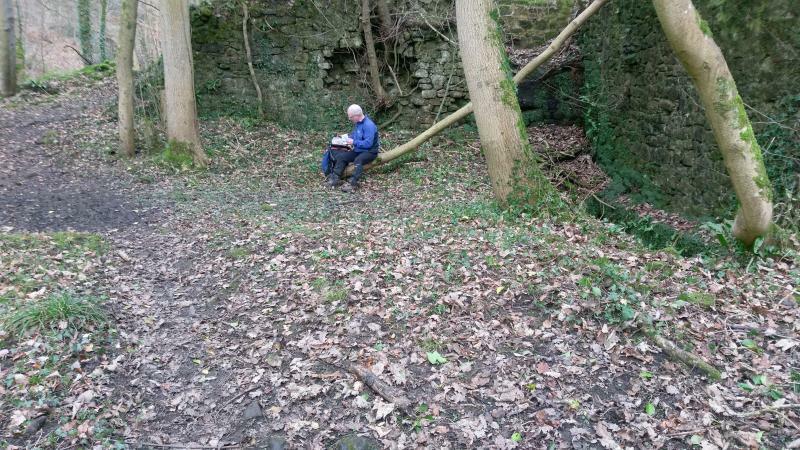 Bagden Quarry is now disused, but once produced large quantities of flagstones, which were transported out of the quarry on a narrow-gauge railway. 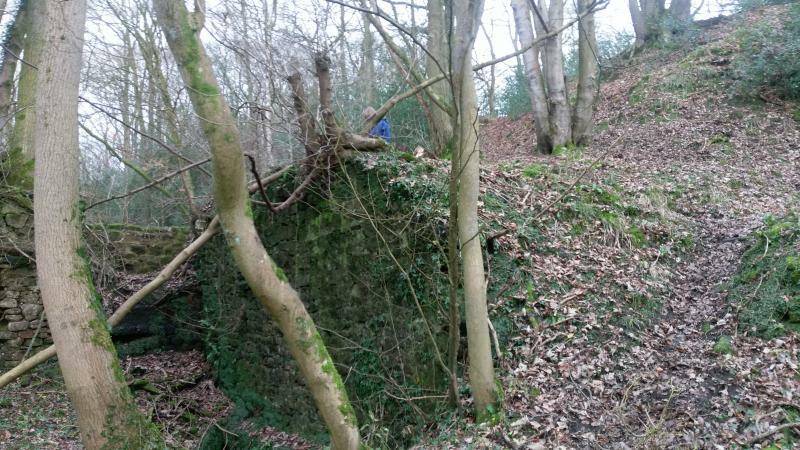 The remains of the building that housed the locomotive can still be seen and the bed of the dismantled railway provided us with a convenient path out of the quarry and eventually to Rooley Moor Road. From there we dropped down from the moor to the valley below. Just before Healy Dell an old mill lodge provided us with a picturesque lunch stop, made all the more attractive by the sunshine that had now broken through the clouds. We then walked through Healy Dell, where the River Spodden flows in a series of waterfalls through a narrow gorge known as the Thrutch. 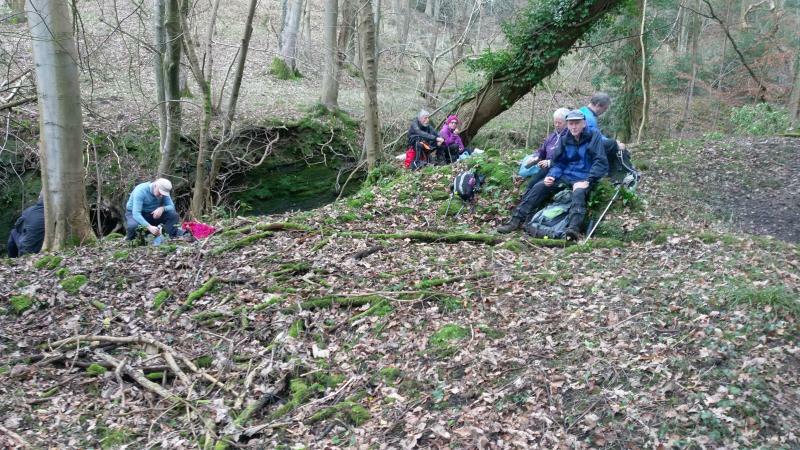 Some of the group took a short detour to view the Fairy Chapel, part of the gorge where the water has carved the rocks into shapes that can be imagined as a pulpit and seats. 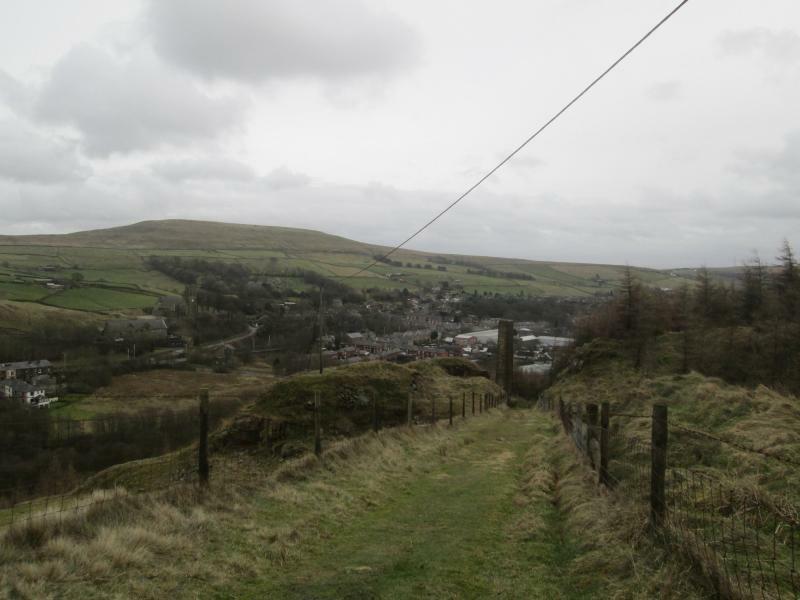 Climbing out of the gorge beneath an impressive railway viaduct, we re-joined the Rossendale Way and followed it across the main road at Healey Corner and up the east side of the valley towards the centre of Whitworth. 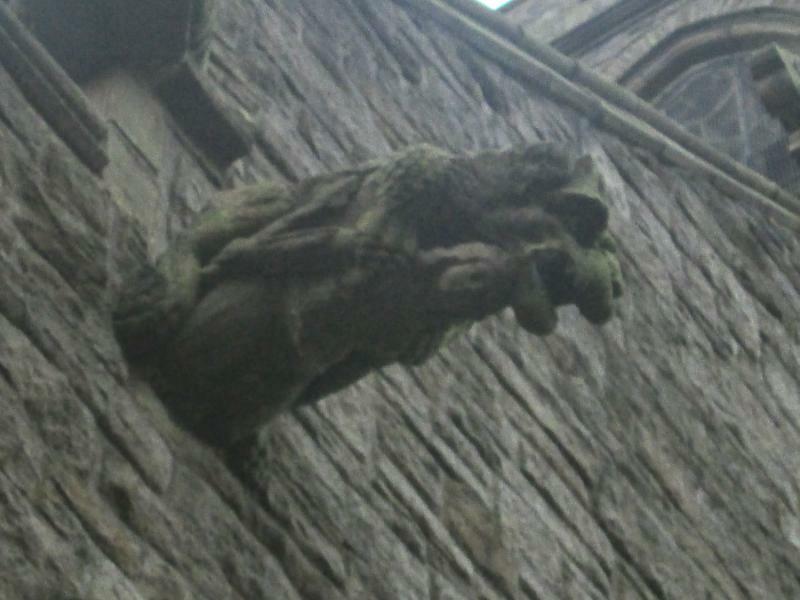 Our first stop in Whitworth was at the church to see a particularly unusual and intriguing gargoyle. 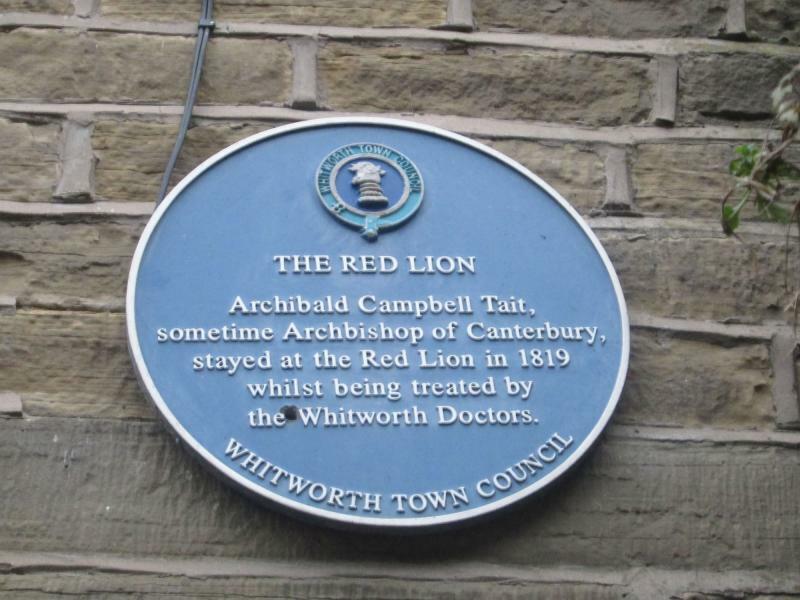 Then it was on to Red Lion Square where blue plaques mark the houses occupied by the doctors and where their patients stayed whilst being treated. 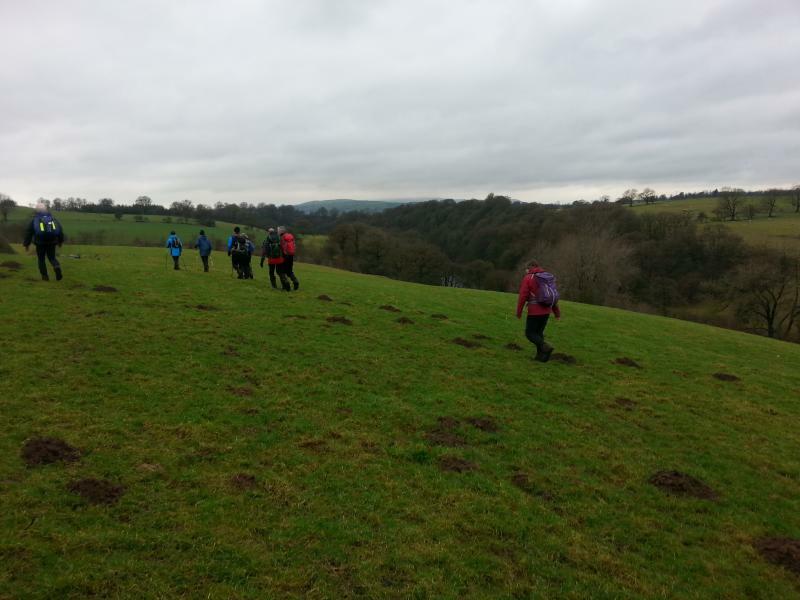 Leaving Red Lion Square, we continued up the east side of the valley before crossing the road and river again to climb the Facit Incline. This was originally built to allow empty trucks to be hauled up from the railway in the valley to the quarries on the moor top and lowered back laden with stone. 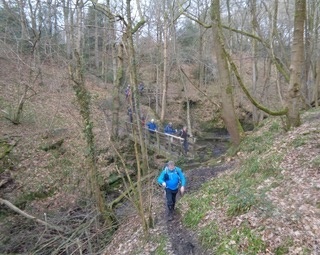 Nowadays it provides a quick, albeit strenuous, route to the quarries for walkers. 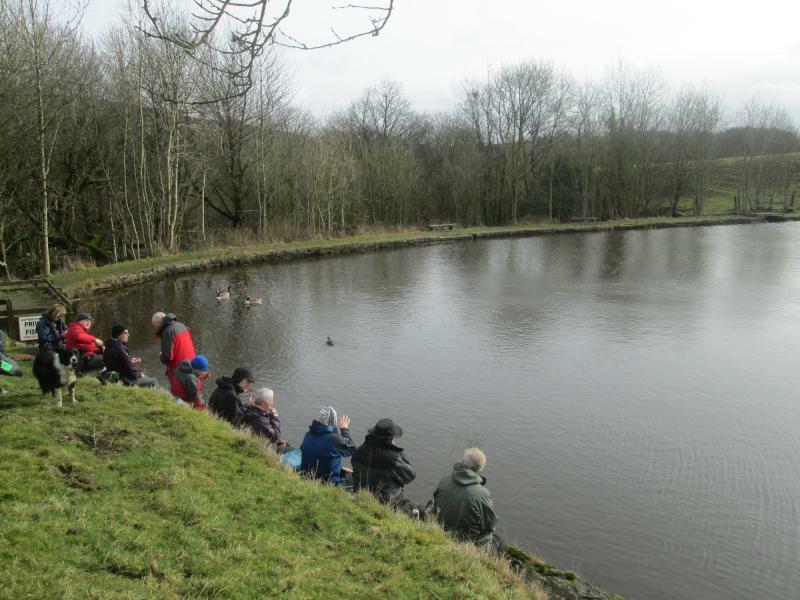 We had now almost completed our circuit and a short walk down the quarry road brought us back to the Cowm Reservoir and the end of the walk. 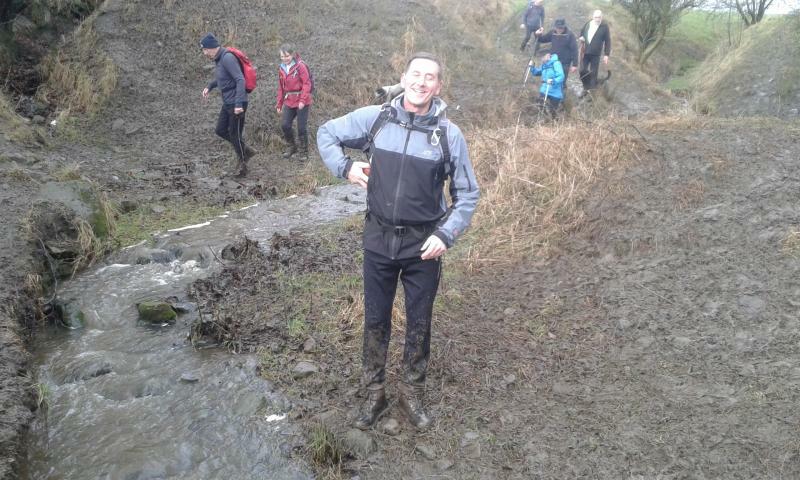 Thanks to everyone who came and tolerated the mud and surface water. Click here for Peter's pictures. Sunday February 19th. 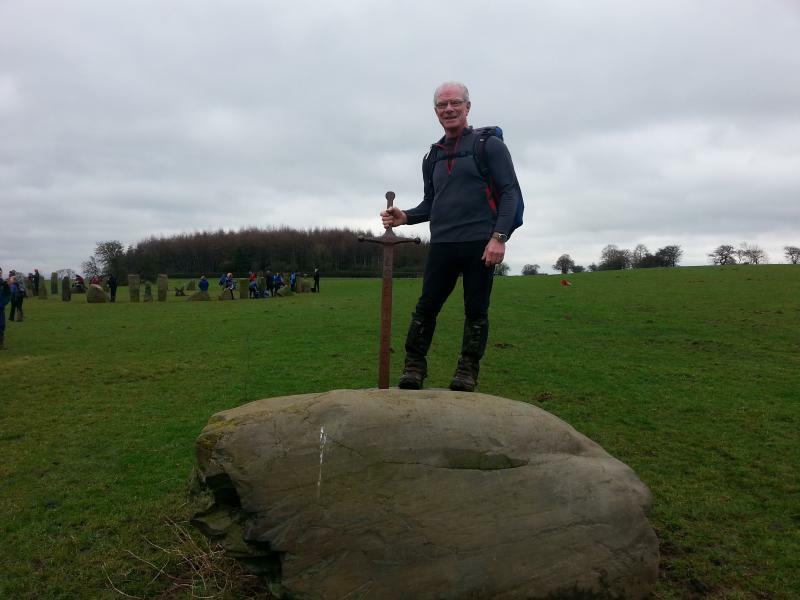 Dove Stone Delight. 20 miles. Leader: Steve Clark. The forecast is for overcast conditions but no rain. 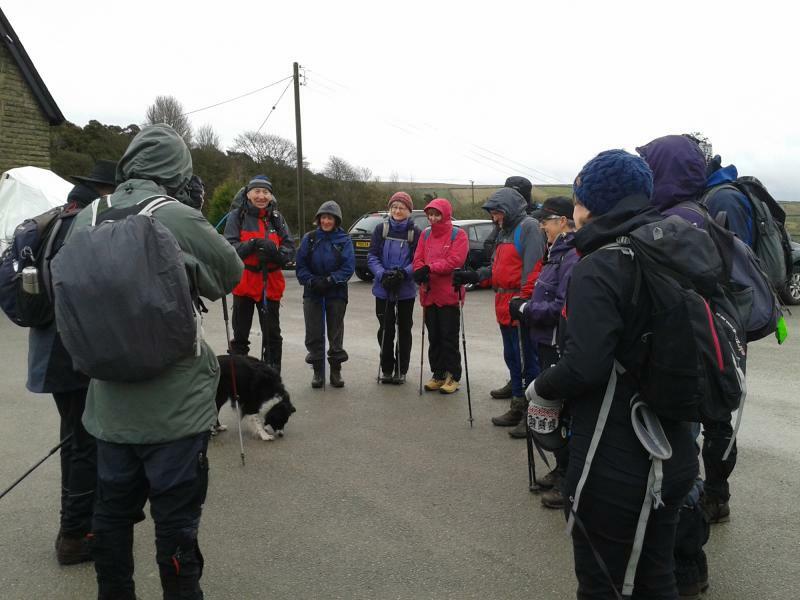 At Dovestones it’s light drizzle and low cloud so most of us set off in waterproofs, that’s 16 including me. 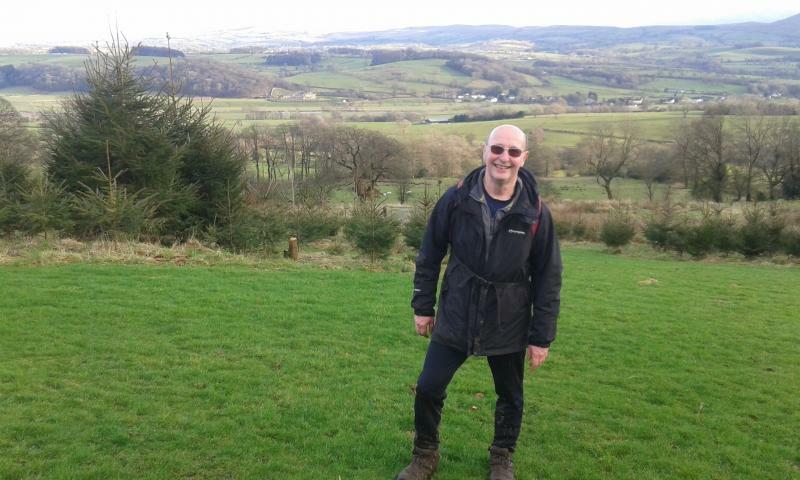 Off round the reservoir and then up to the Oldham Way (OW) to contour into and the round the Chew Valley before dropping back to the reservoir. 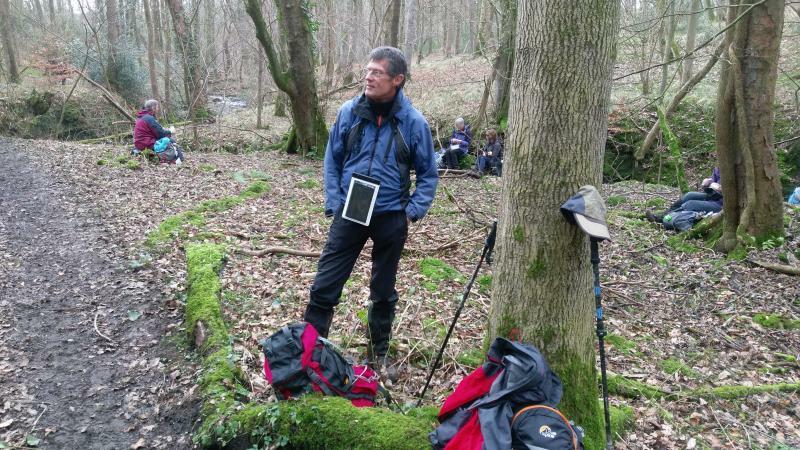 I have to omit the circuit of Yeoman Hey reservoir and save 1.5 miles from the recce. 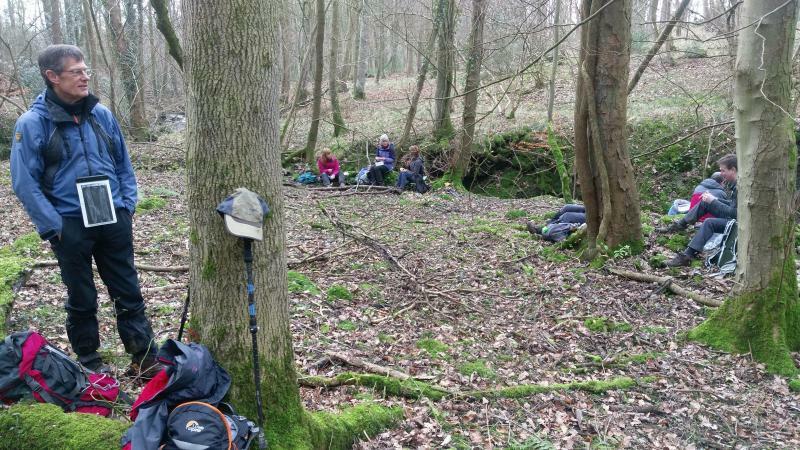 Keep on the OW and contour under Alderman’s Hill before uphill to Pots and Pans and the war memorial obelisk to be found there. Coffee break. The fine views were hidden by the low cloud that enveloped us. 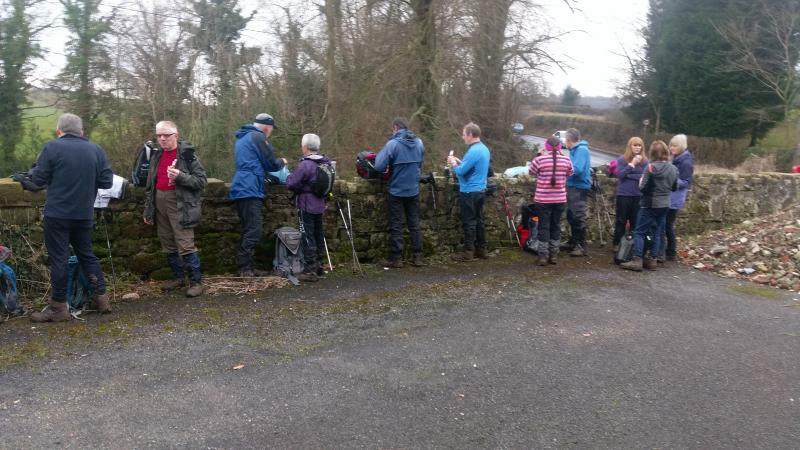 Continue to follow the OW along to the Church above Uppermill and then descend to the visitor centre on the canal stopping to use the toilet facilities at Limekilm. It’s dry by now. 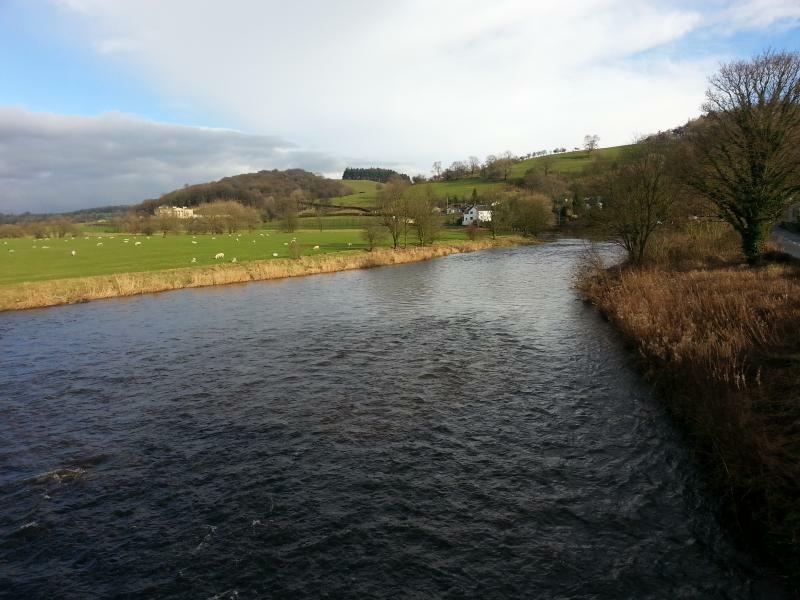 Follow the Tame Valley Way and Huddersfield Narrow Canal though Uppermill and then Mossley. 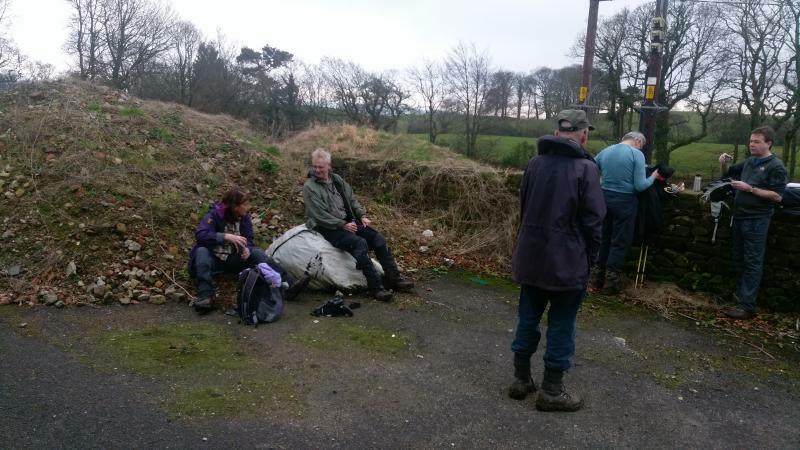 Come out on the road at Bottoms and then back on the canal for our lunch stop in the shelter of a retaining wall. 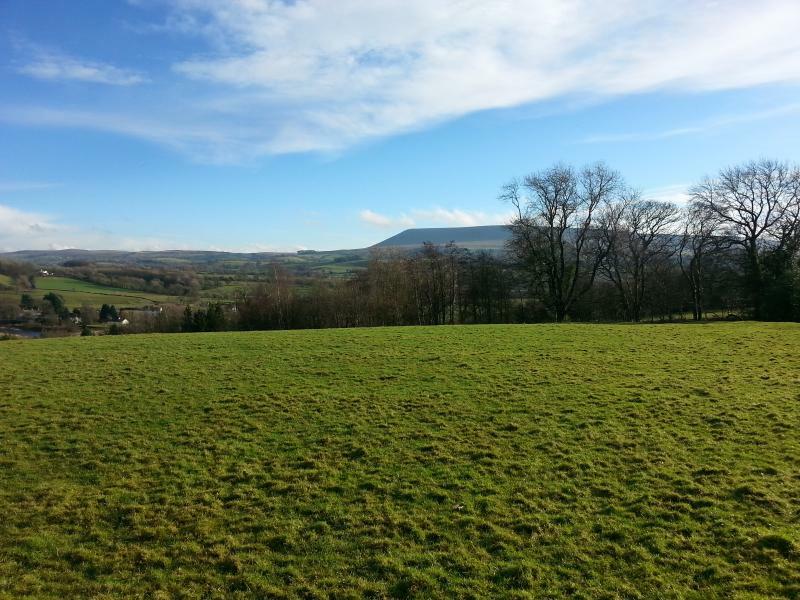 Follow the canal for a little more before breaking out of the valley at Millbrook village and climbing to Stalybridge Country Park and the moors around Higher Swineshaw Reservoir. Climb a little further over Slatepit Moor before dropping down to Carrbrook where we stopped by the duck pond to use any remaining coffee we might have. From here tracks and paths were used to contour round the bottom of Buckton Moor to return to Dovestones Reservoir at ten to four. My GPS had 19.9 miles on the trip, with 888m (2,913’) of ascent. Thanks to all who were on the walk. Click here for Howard's pictures. Wednesday February 15th. Looking for the Legion. 13 miles. Leader: John Thompson. 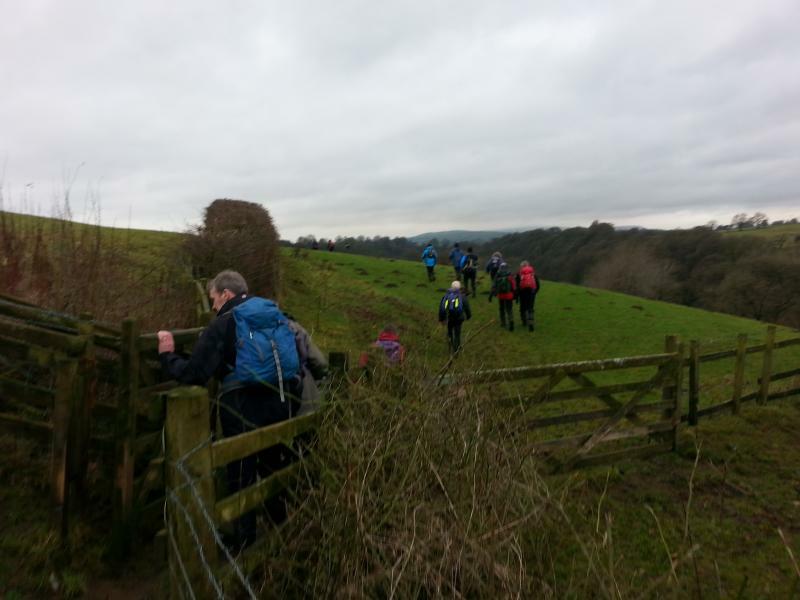 23 people & two dogs (what a turn out) started on a figure of eight (13 miles) from Marles wood on a cloudy and mainly wind free day. 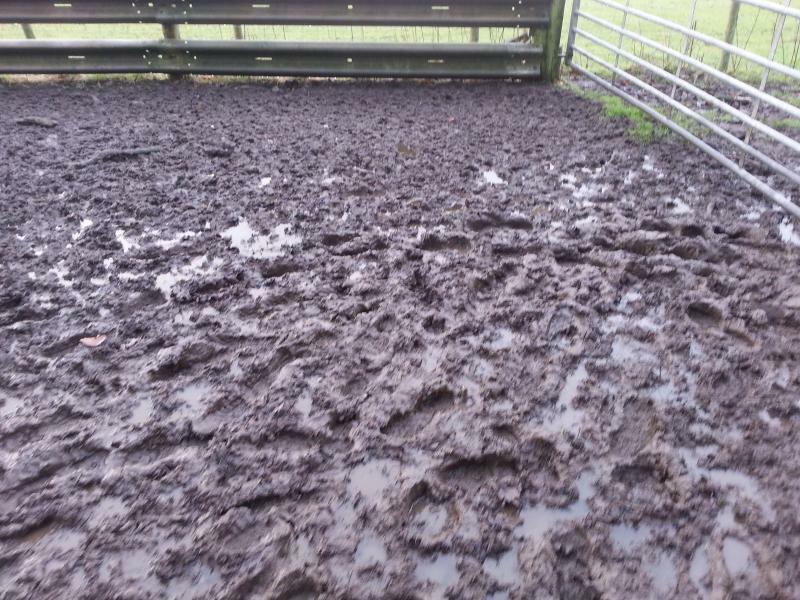 Underfoot was muddy to very muddy to what the !!heck!!. 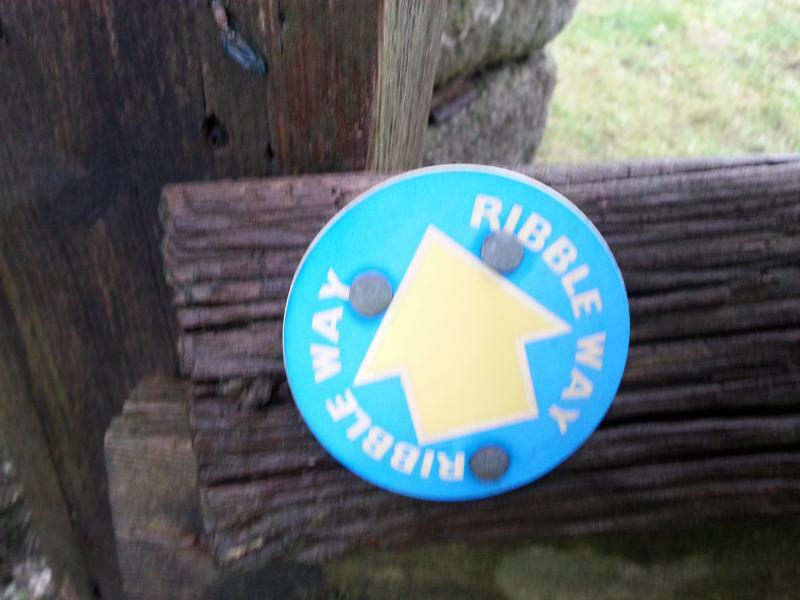 On then to Bradley Wood, down to Ribchester Bridge, right on the Ribble Way to Dewhurst House & Stewarts Wood. Over a footbridge up to Bailey House & first stop of the day at a disused pub. Onwards up then to Doe Hill & Greengore, Higher Hod Lee, Lane Ends, Moorcock farm, Dean Brow and down to boggy Duddel wood for lunch. 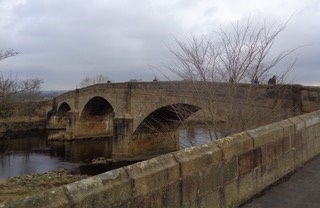 Then to Little Stydd Wood over footbridge & right leading to East Barn farm & Ribchester Bridge. 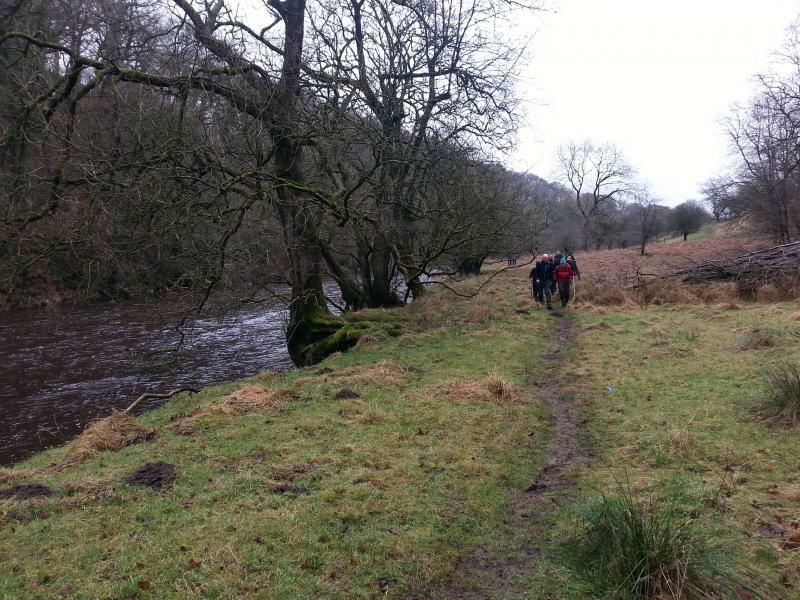 Passing over the bridge past Newhall (on left) to car park, then right towards Lower Madgell Bank where we joined the course of the Roman Rd (this was the muddy !!heck!! area). 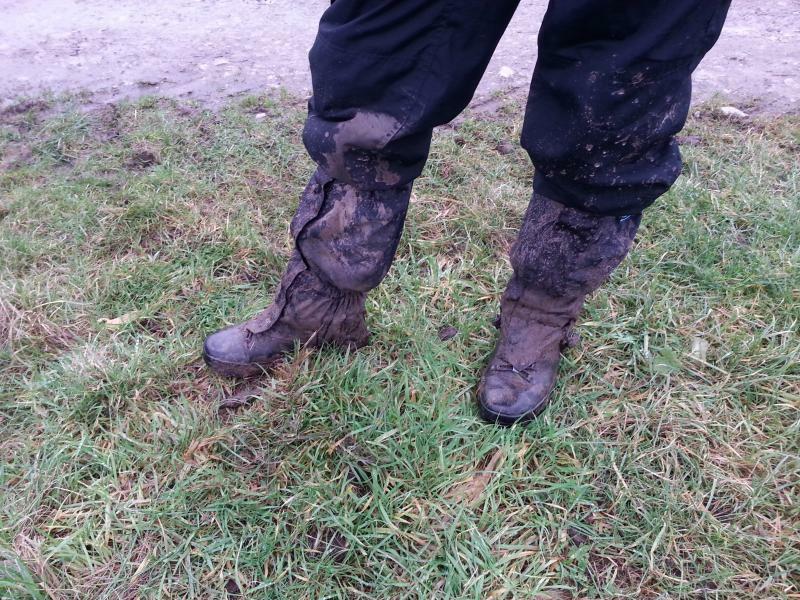 Onto White Holme, Bolton Hall, Park Gate, and back to Marles wood where I demonstrated my boot cleaning spray. All were amazed and some also used it. We never did find the Romans but when asked a local said "the Romans; you have just missed them, they only moved out in the late fourth century." 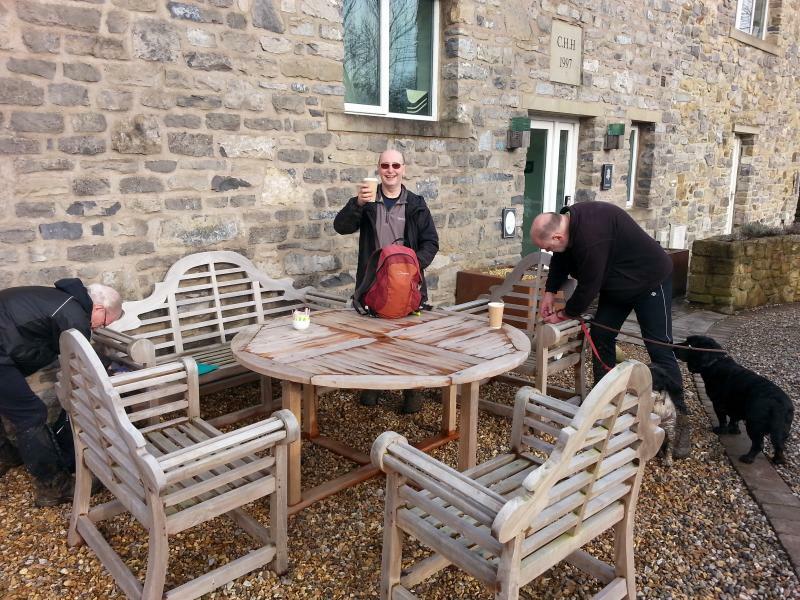 Some of us then went to the local pub. Thanks to all who came, great day, lots of laughs. Pictures below by John and Peter Smith. Click here for Peter Steckles' pictures. Wednesday February 8th. Beaumont Bash. 12 miles. Leader: Hilary Scott. The title was chosen as the original starting point was the Beaumont Arms in Ladybridge. However this now closes during the day, so I decided to lead the walk from my house and offer drinks and snacks before and after the walk. 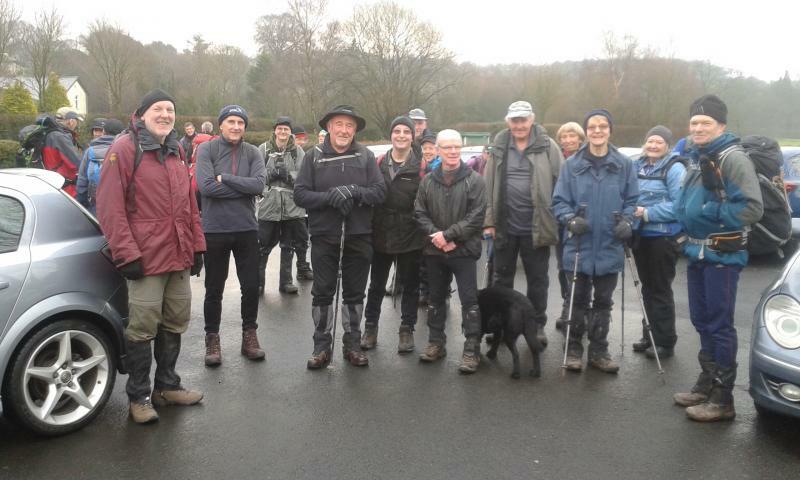 15 walkers and 2 dogs duly set off on a dull day to find 4 golf courses before lunch. 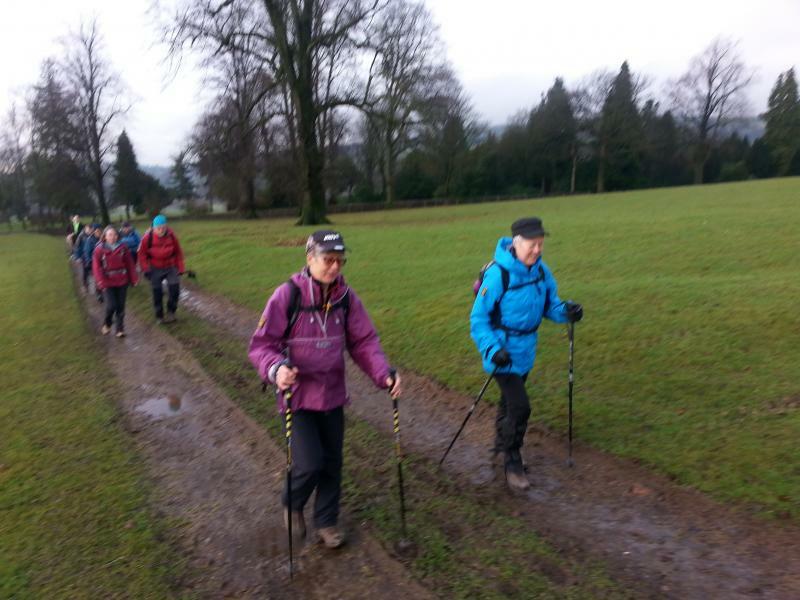 After passing through Deane golf course we took the Middlebrook path to Lostock and turned to walk through Regent's Park golf course. For those who hadn't heard the tale, we paused at the water works to hear about the Thirlmere Way and corresponding gates. Crossing busy Chorley New Road we climbed up to High Rid reservoir passing Bolton golf club on the way. Making our way over to Barrow Bridge we walked through Old Links golf course to complete the set. 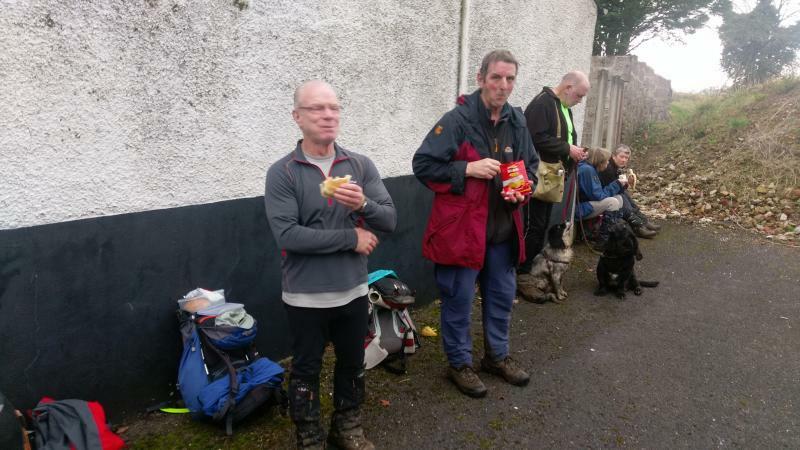 Lunch was taken at Barrow Bridge and then it was onwards to Horrocks Wood with misty views over to Peel Tower and the Pennines. I had advertised this walk as mainly tracks but at this time of year a lot of the paths and tracks were rather muddy so points were lost. Crossing the last field Viv elegantly slid to the floor to cover her backside in mud, she took it in good part though. Passing Smithills Farm we detoured round to look at Smithills Hall which was closed for renovation work. Walking on we reached the edge of Moss Bank Park and the tall chimney there. 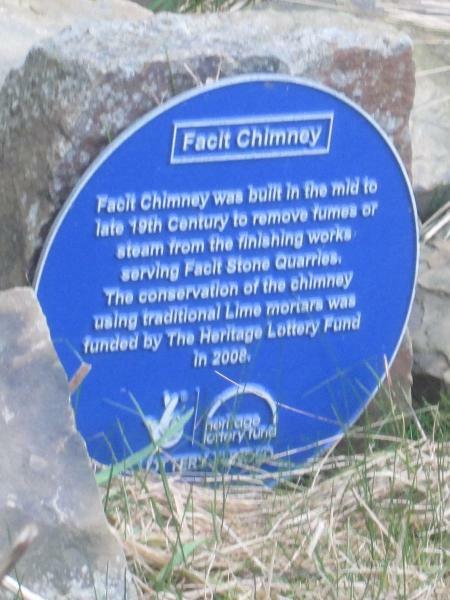 Phil (good to see you back) told us some of the history of this chimney. It was a quick break in Moss Bank Park and then we made our way through housing to Doffcocker Lodge. One path was nearly blocked with rubbish that people had just thrown over the fence from the houses backing onto it, a real disgrace to them and the area. Doffcocker Lodge was much pleasanter and Barbara pointed out some of the waterfowl there. 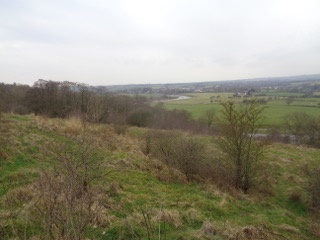 We then walked down the hill, back across Chorley New Road and onwards to Ladybridge. 10 of the group came in to eat my cakes, a good job as I'd made quite a lot! 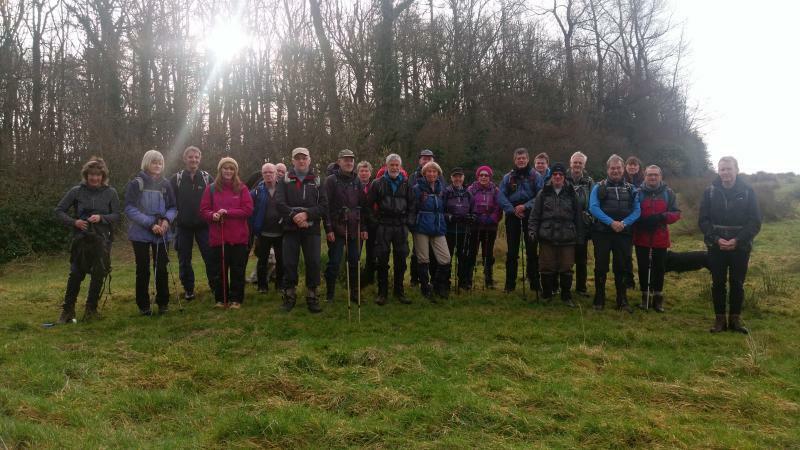 A good day out, thanks to all who came. Sunday February 5th. Looking for Mr Darcy. 20 miles. Leader: Neil Smith. 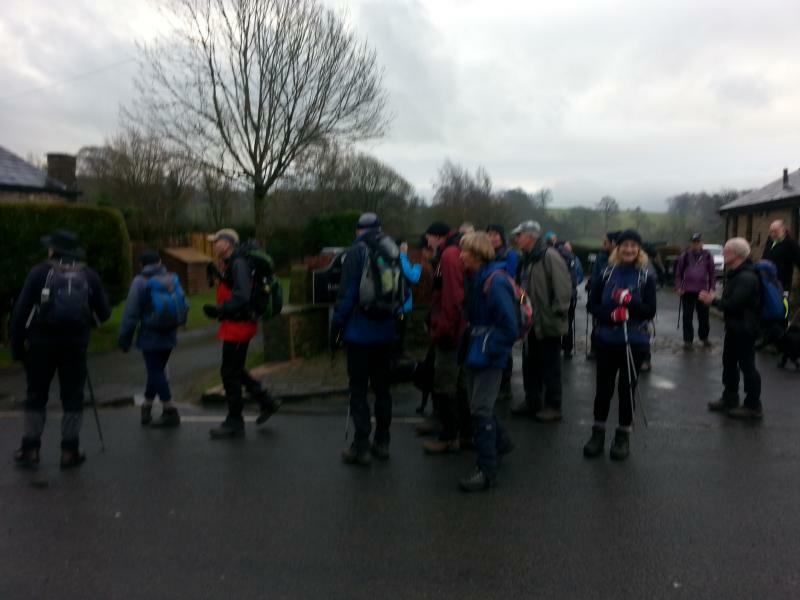 20 walkers started from the revised start point at 9am to ascend up Station Rd to pick up the Peak Forest canal at lock no 9, we followed the towpath to the top lock No 16 before turning right onto the Macclesfield canal. We followed this for approx. 4 miles to a canalside cafe for our morning break and toilet stop. Continuing further along the canal we then left this to make our way through 2 fields and Redacre Hall farm to enter Shrigley Rd before climbing to Dale Top and then Sponds hill, the highest point of the walk. The sun was out in force on this climb until we got near the top where inevitably it clouded over and became much cooler. 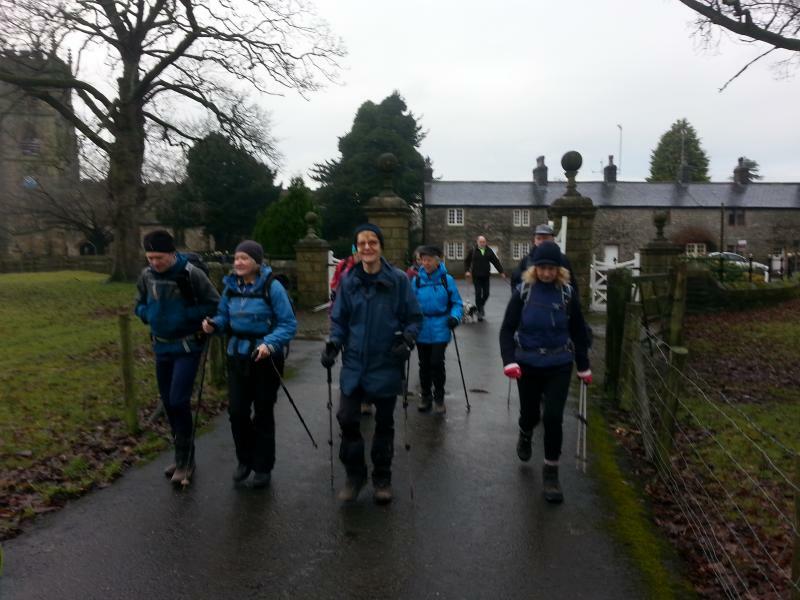 We then picked up the Gritstone trail to take us into Lyme Park where we had our lunch break, but 'alas' no sign of Mr Darcy! 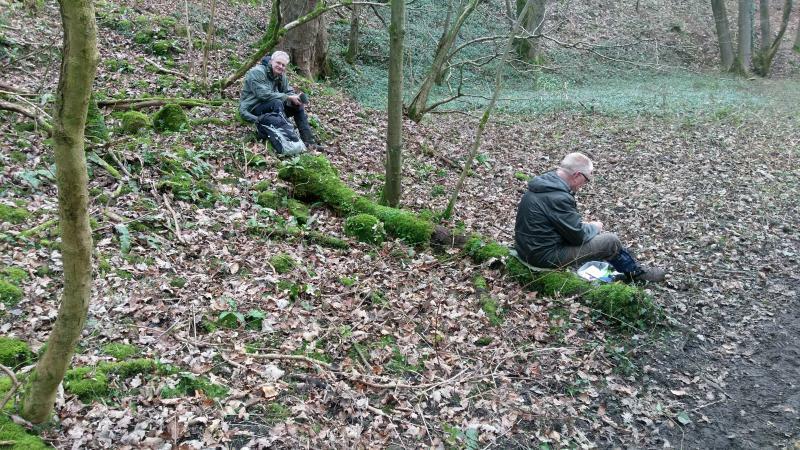 The route then took us out past the "Cage" on a high point in the park, used in days gone by as a retreat for the wives of hunters; to pass through Disley, crossing the A6 and rejoining the Peak Forest canal. 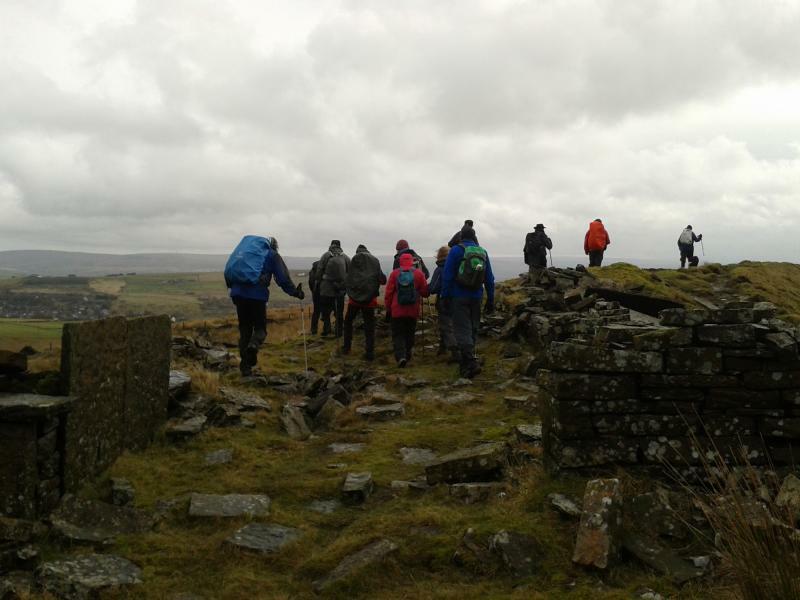 This was then left again to drop down to the Goyt valley and river for our mid afternoon break and visit to the Roman lakes. A steady climb brought us back to the canal to then descend all 16 locks to the aqueduct and viaduct that span the River Goyt (passing several places undergoing restoration). Descending to the river this was followed to take us into Brabyns Park and then back to the car park to finish. 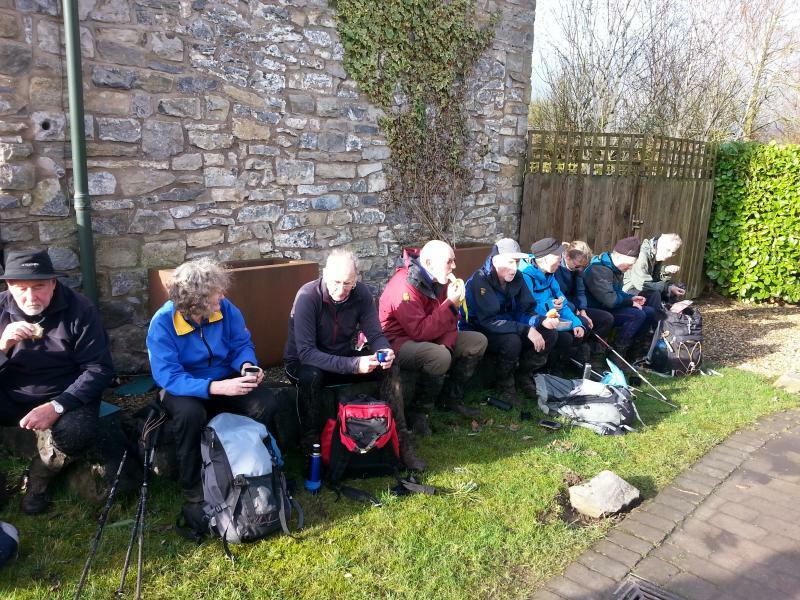 A refreshing drink was had by 12 of the group in the Midland pub to finish off a good day. Wednesday February 1st. Bowland Winter. 13 miles. Leader: Roger Jackson. 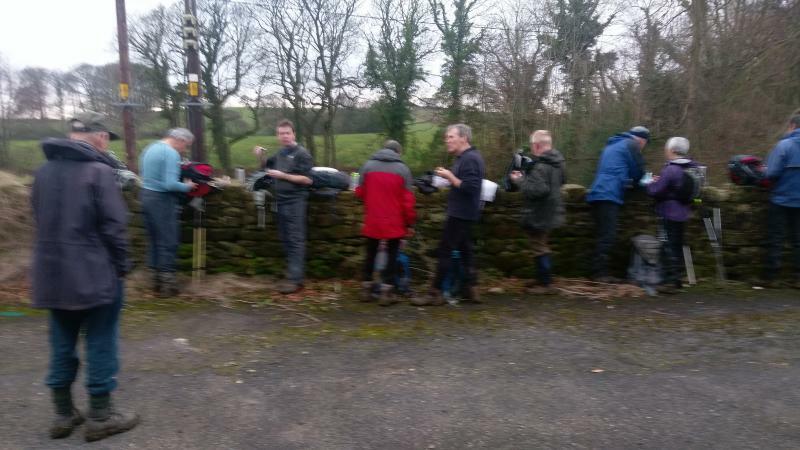 A party of twenty six people and three dogs set off from the Bolton by Bowland Car Park , on a cloudy morning but forecast to improve throughout the day. Initially heading towards the church we then turned down King Henry Mews a signposted metalled way leading to towards Bolton Hall Farm. It previously led to the now demolished Bolton Hall home of Sir Ralph Pudsay. Just before the farm we turned left over a series of fields eventually crossing the River Ribble and reaching Ribblestone Park, near Gisburn, where we had our mid morning stop next to the excellent Park café. 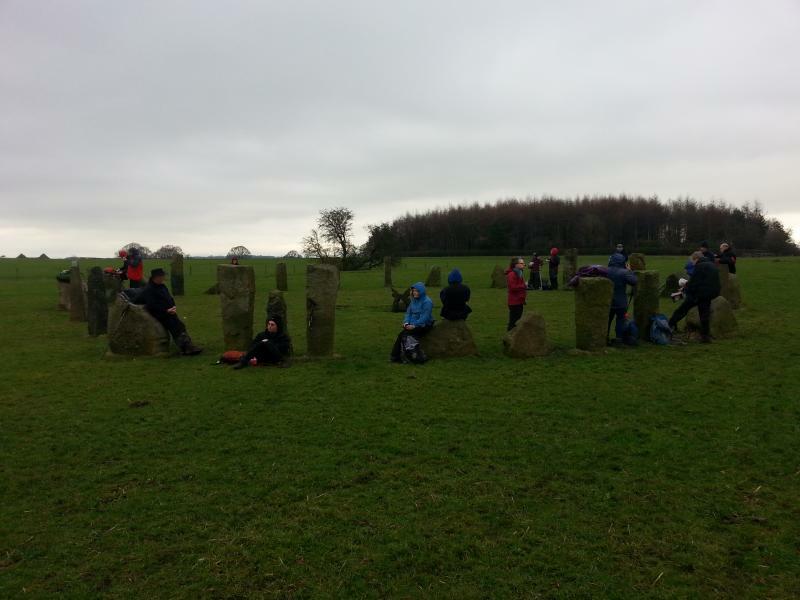 We then followed the Ribble way , again through the fields (one very muddy one) , reaching our lunch stop next to what resembled a mini Stonehenge. 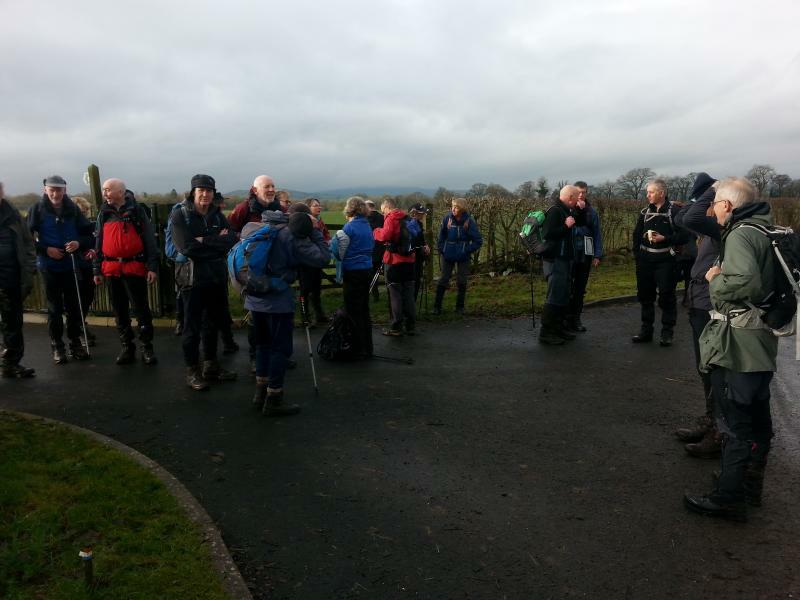 After lunch staying on the Ribble Way , crossing the railway twice, we arrived at Sawley. 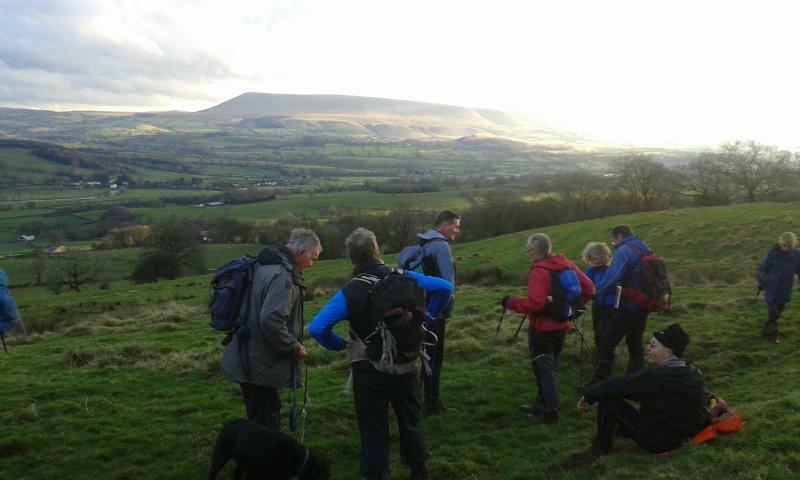 Leaving the Ribble Way we then had a long climb to Higher Heights where we were rewarded with a wonderful view of Pendle Hill in the background and Bolton By Bowland below us. A fine place for our final coffee stop. 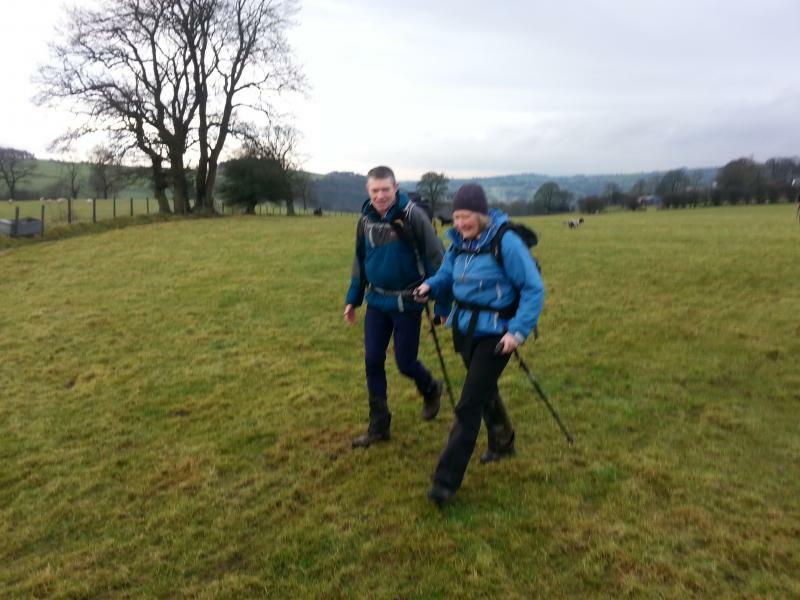 Then all down hill back to Bolton By Bowland.